You may think you’re lavishing your pet with all the love in the world but ‘humanising’ him too much may be killing him. The growing trend of ‘humanising’ pets is leading to a surge in potentially serious health issues. Obesity, behavioural problems and the rise of designer breeds have all been linked to this growing trend of ‘humanising’ or anthropomorphism. Our poor nutritional choices for our pets lead to obesity and ill health and our lack of training and discipline increases antisocial behaviour. And the ever-increasing demand for animals with a particular ‘look’ has led to extreme breeding which is having a profound impact on their health (for e.g., pets with squashed faces have respiratory issues). Feed them human snacks as treats. A British survey in 2016 revealed that nearly 6 million pets in the UK are given treats as part of their daily diet. These treats include crisps, cheese and chips. 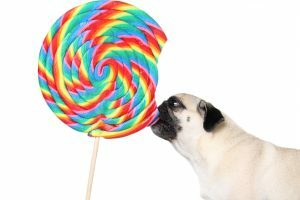 Human snacks contribute significantly to obesity in pets which, in turn, is an important contributor to killer diseases like diabetes and heart disease. Dress them up like babies or dolls. While there is a case for a comfortable coat in winter on shorter-haired dogs and smaller dogs, our tendency to treat our dogs as fashion accessories or children can be harmful to their health. Ballet tutus, booties, hats, sunglasses, and pushing dogs or cats in prams have emerged as fashion trends for pets. Restrictive clothing can chafe the skin, cause skin ailments or become caught on fencing putting the dog’s life at risk. Keeping a dog confined to a pram, restricts its normal behaviour. When dressing a dog in a coat or jacket, it is important to ensure it is properly fitted and suited to the dog’s natural movements. Wash dog clothing regularly . Follow celebrity trends. 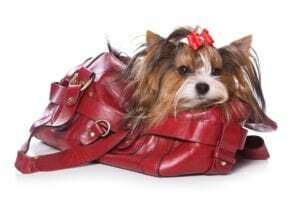 A few years ago, a popular trend among fashion models and socialites was to carry small dogs in handbags and to take them everywhere, including music concerts and busy restaurants. This not only inhibited normal behaviour and exposed them to harmful noise but when the trend waned, the dogs were left out in the cold. Once the fashion died, the dog was ignored. Certain breeds were also favoured over others leading to over-breeding and in-breeding and a clutch of abandoned pets once that trend had faded. Carry them everywhere. The ‘handbag dog’ trend led to increasing numbers of owners carrying their dogs with them wherever they want, rather than letting them walk. It was easier to pick up a dog than train it to walk on a leash. Dogs, like humans, need to walk and run to stretch muscles and strengthen bones. Give them human medication. Human medication should never be given to pets; it can be toxic and may kill them. Follow human food fads. Whether it’s veganism or Banting, there are ardent believers who will impose the same food fads on their pets. Pets have different nutritional needs (premium quality protein is essential) to humans and their age and their breed can also impact their dietary requirements. Nutrition is the cornerstone of good health and finding the right diet for your pet will not only impact his current health status but can help him live longer. “Pet ownership is an enormous responsibility and pet owners must familiarise themselves with what this means before taking an animal into their homes,” urges veterinarian Dr Hilldidge Beer. “You are adopting a sentient being, but one that has its own unique characteristics that need to be understood and appreciated. If you’re not sure of your pet’s needs, ask your vet for advice or assistance.